NICKEL FREE! Our medical plastic daisies are best sellers! A 5mm setting with Swarovski Crystals set in pure Medical Plastic. Medical Plastic is completely nickel free, no metal at all, which guarantees comfort all day. These are skin friendly earrings that are perfect for anyone, even for those who have sensitive ears. Available in many colors. Available colors: Crystal, Rose, Sapphire, Peridot, Rainbow, Alexandrite/Rose, Light Rose/Amethyst, Aquamarine, Violet, Light Rose/Rose, Alexandrite/Sapphire, Golden Rose, and Amethyst. Do you have blisters on your ear? Does your ear bleed or get inflamed after you use earrings? If yes, chances are you are allergic to metal earrings. Nickel is a metal that is the source of a number of skin allergies. From skin irritation to boils, nickel can cause different types of injuries and infections. Choosing hypoallergenic jewelry, like our best earrings for sensitive ears earrings, that will save you from a lot of trouble and discomfort in the long run! At Blomdahl USA, we sell a large collection of the best earrings for sensitive ears that are skin-friendly and the best for anyone who has sensitive ears. 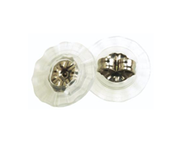 Ourmedical plastic earrings are made from a special material that is used in surgical sutures and which contains 0% nickel. A person even with the most severe nickel allergy will find these hypoallergenic earrings comfortable and safe to use. You can place an order for our products on our website. If you have any questions about the products we sell, feel free to contact us via call or email. Why Should You Use Blomdahl USA’s Hypoallergenic Daisy Earrings? Earrings contain multiple metals which can be extremely abrasive to your skin. Using them on a continuous basis can lead to ear-related injuries and infections. Medical professionals recommend that earring users wear only hypoallergenic jewelry for daily use, as they prevent allergies and diseases. Non-hypoallergenic earrings are the cause of multiple metal allergies. While some last only for the duration of the jewelry use, others have long term impacts. Using nickel-free jewelry will save you from experiencing painful allergies and injuries. Dermatitis is a skin infection that develops as a result of an allergic reaction to a material that is in close contact with the skin. When you use nickel based metal jewelry, you may experience a sudden outbreak of rashes, excessive itching, blisters, pus-filled boils and flaky and leathery skin. These are indications of dermatitis. Contact dermatitis: This occurs as a result of an allergic reaction that you have due to the metal and plastic jewelry that you use. Atopic dermatitis: This is a more severe form of contact dermatitis that is also a result of genetic factors. Any person, who is more genetically likely to develop dermatitis, will have a very severe and extreme reaction to metal jewelry. A skin irritation as a result of metal allergy, Erythema results in skin turning red and patchy. Blisters and lumps form on the ears, where the skin has had contact with the metal. Sometimes certain types of metal and plastics lead to skin becoming scaly and leathery. This condition is called Eczema. You may even experience itching and rashes as a result of the scaling on the skin. Often times, eczema affects a spread of the skin that jewelry is exposed to. Choosing hypoallergenic bracelets and necklaces is a great way to ensure the discomfort of eczema spreads to other sections of skin. One of the worst skin infections there is; Impetigo leads to skin developing pus-filled blisters and lumps. Any part of the skin that was exposed to the metal will become inflamed and red. As time passes, the sores and blisters will become tender and rupture, causing severe pain and infection. The allergic reaction sometimes isn’t severe enough to lead to skin infections and conditions. Sometimes flaky skin and minor blisters are indicative of the onset of a metal allergy. The moment you notice signs of these, you need to switch to hypoallergenic jewelry. Blomdahl USA has an extensive collection of nickel-free, medical grade jewelry. Take a look at our website to see some of the Daisy Rose crystal earrings we have in stock. At Blomdahl USA, we offer the best earrings for sensitive ears, as well as, hypoallergenic earrings, bracelets, and necklaces to bring comfort and style to those with skin allergies! My 6yr old was pierced with white gold earrings, switched to gold, switched to sterling silver... and still after 9 months they just wouldn’t heal. These have only been in for about a week and her ears look the best they have since getting pierced! I’m so excited that we may finally be on the path to healing thanks to these earrings and this company! ADORABLE! Absolutely perfect for my 21 month old twins. They are the perfect size and the quality is awesome! Love them! My girls have a lot of allergies when it comes to earrings and these are the only ones which are cute and they can wear! Thank you for such a great product!! Yes. Color, size, performance, quality, these earrings do not disappoint. So far these earrings are slept in or haven’t been removed from these case sensitive ears since purchased. I hope that we have a new friend in Blomdahl. Love the plastic earrings for my daughter. No reactions for newly pierced ears. These earrings are so sparkly and sweet. My daughter is 7 and loves these earrings. She has a lot of good allergies and eczema. We were worried about getting her ears pierced and her having a reaction. She got them pierced with the bloomdahl earrings and we just changed them to the cute daisys. They are a little small but we love them!